It doesn’t mean they’re gonna be good in the future, but for this season the team has bowl eligibility within its grasp. Don’t look now friends, but Tennessee might just make a bowl game. After beating Kentucky pretty handily, 24-7, the Vols ate are at five wins with two games remaining. Nothing is certain, but a bowl game for Pruitt in his first year would be a pretty big deal, and an overperformance relative to preseason projections and general expectations. Tennessee doesn’t boast the overall returning production you would hope for, following a youth movement, and because the fall was so drastic last year, the Vols are projected only 79th in S&P+ this year. I could see something closer to a top-50 performance with the right breaks, but either way, the goal is simply reaching a bowl. UT is a projected favorite in three games and a one-possession underdog in four others. Getting to six isn’t impossible. With Kentucky, the roadmap was clear. If you hold them under 3 yards per carry, you win (unless you’re Missouri, in which case you’ll lose on an untimed down after regulation). The Wildcats did rush for 3.9 sack-adjusted yards, but Tennessee changed the game state by halftime by getting out to a big lead and making the Cats have to chase the game. Pruitt had his defense ready to stop the ‘Cats, and held them to only 3.6 per play. Pruitt’s shown an ability to come up with creative blitz packages like this. And when you’re up 17, you can really sic the dawgs on your opponent. Tennessee’s showing some fight late in this season. That’s more than can be expected for a team that tanked at the end of last season. Tennessee navigated a tough four-game stretch by going 1-3 (against South Carolina in a close loss, Alabama, Georgia, and Auburn). They aren’t making the Playoff anytime soon, but they do actually have postseason hopes within grasp with Missouri and Vanderbilt ahead on the schedule. Win one, and the Vols are bowling. This is where I tell you not to make this into more than it is. This is one football team getting incrementally better over the course of a season. They won one game you wouldn’t have projected them to earlier this season against Auburn, and they beat a pretty good Kentucky team. They nearly beat South Carolina, and the Florida game was a bit flukey due to six turnovers. 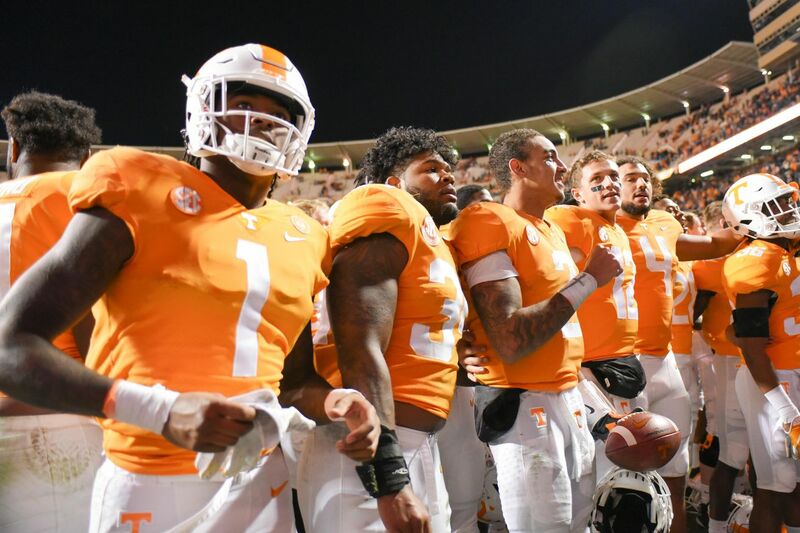 The Vols are in a good place for now, and it can very well mean nothing long-term. Neither Tennessee nor Jeremy Pruitt have done really anything to earn benefit of the doubt about parlaying this. You’ll remember: one Derek Dooley struggled through his first season to 2-6, then won out to make a bowl game. It can go really poorly in the future, but for now the Vols are looking alright.